When we were living at Darapuram and I was seven years old, I was initiated into Linga puja. Such traditional upbringing gradually involved me in the study of the Sastras, doing japa, bhajan, saguna and nirguna dhyana (form and formless meditation) and regular puja three times a day. During this period I also had three gurus. I came to the conviction that the highest human attainment was the state of Jivanmukti (full enlightenment whilst still in the body). I was then at Tiruchengode (1921-1925) studying in college. When I was 18 years old, I fervently prayed that I should meet a Jivanmukta and receive his blessings. My prayers were soon answered! My father, a police officer, was transferred to Tiruvannamalai. I came to know of Bhagavan Ramana living there. I gave up my studies and rushed to Arunachala. At Katpadi, while traveling in the train towards Tiruvannamalai, I had a remarkable vision of Bhagavan. Thus my Sadguru came to me and absorbed me even before l could have His physical darshan! My right hand was badly fractured when I was 14-years-old and though it healed up the hand remained bent and short. I used to cover it up with full sleeves and even my friends did not know of this serious deformity. How did Bhagavan know about it? And what affectionate concern He showed! After Bhagavan inquired about it, my sense of inferiority because of the defect totally disappeared. More than all this, He asked me to be seated in front of Him. Gazing at Him I sat down and I do not know what happened to me then. When I got up two hours had elapsed. This was an experience I had never had before and I have always cherished it as the first and foremost prasad and blessing received from my Sadguru. That day I understood the purport of the statement, “The Sadguru ever gives unasked!” That moment I knew I had been accepted into His Fold. This strong bond He allowed me to enjoy until His Mahasamadhi, and even after. 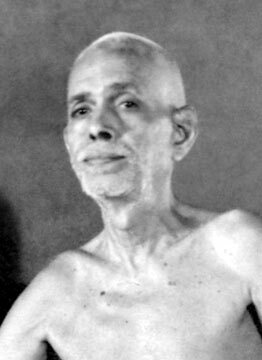 Daily I would go to Bhagavan by two in the afternoon and return home only at 8 p.m. My father, who was a staunch devotee, was instrumental in constructing, in a remarkably short time, the Old Hall where Bhagavan was to stay for more than twenty years. Bhagavan would quote from Ribhu Gita, Kaivalya Navaneetam, Jnana Vasishta and other Advaitic texts and explain to me their greatness. All the while I was aware I was in the blissful presence of a Brahmajnani, so highly extolled in all our scriptures. My father was suddenly transferred to Vellore. None of us, particularly myself, wanted to leave Tiruvannamalai since darshan of Bhagavan would then be denied. We ventilated our grievance to Bhagavan. He gave me a benign smile. A few days after, strangely, the transfer order was canceled!